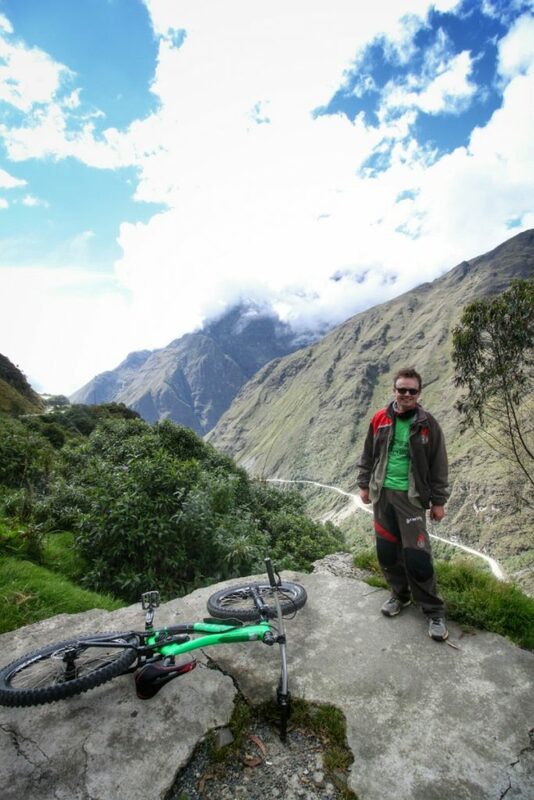 Bolivia’s most infamous road, on a bicycle. 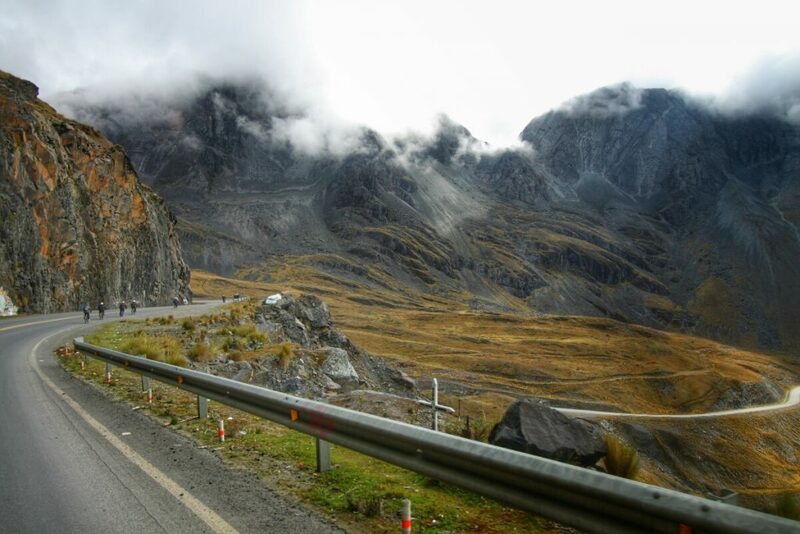 The Yungas Road, or Death Road, weaves its way from the altiplano near La Paz down into Bolivia’s Yungas region. In 67km or so you lose 3600m in altitude. Despite being the only route to the jungle for 70 years, the road is a dirt track, barely a car wide in places, carved precariously into the cliff face. 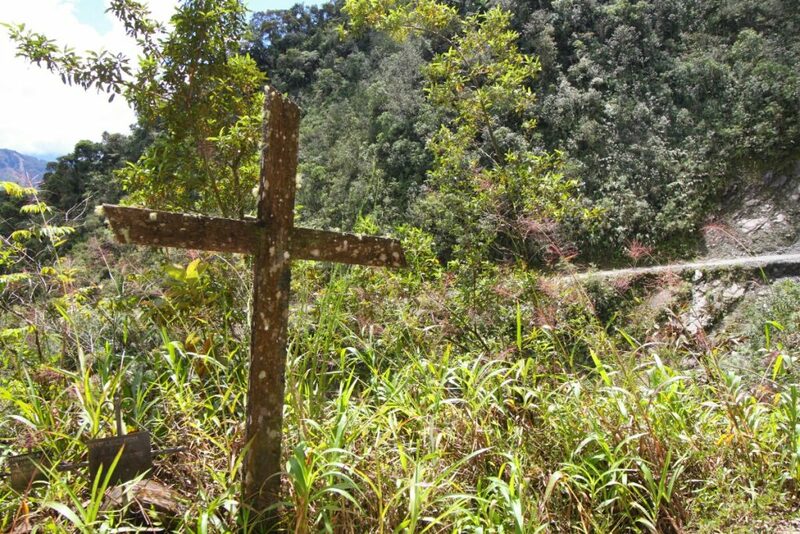 An estimated 200-300 people died on the road every year, leading the Inter-American Development Bank to declare it the world’s most dangerous road in 1995. 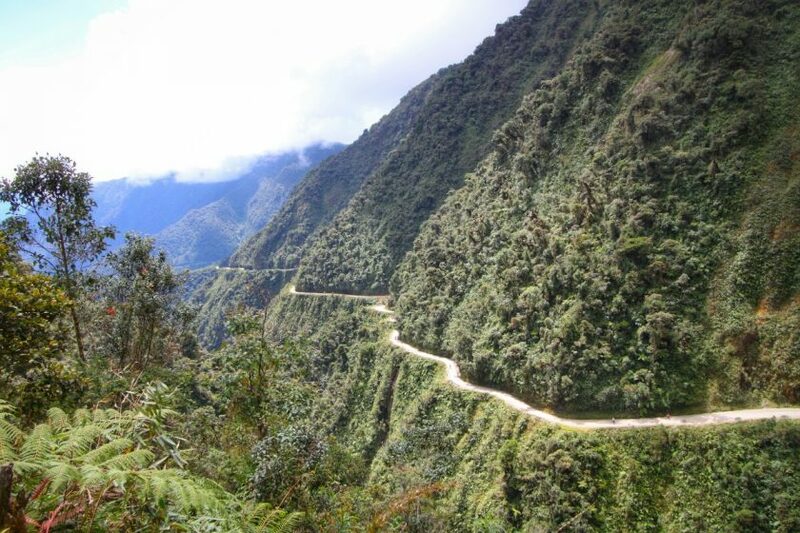 Since 2007 a new, bitumen road has connected the Yungas to the rest of Bolivia. 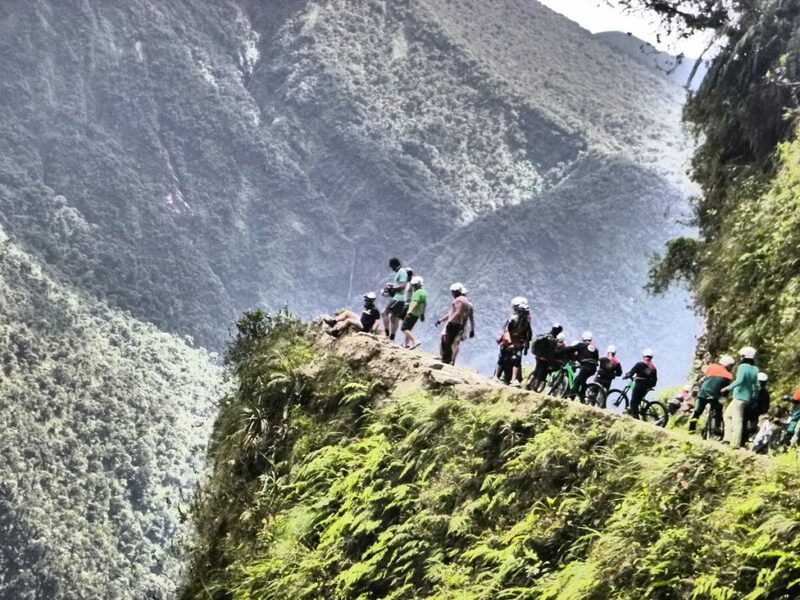 So while the Death Road is still open to traffic, it has become a mecca for thrill seeking tourists on bicycles. 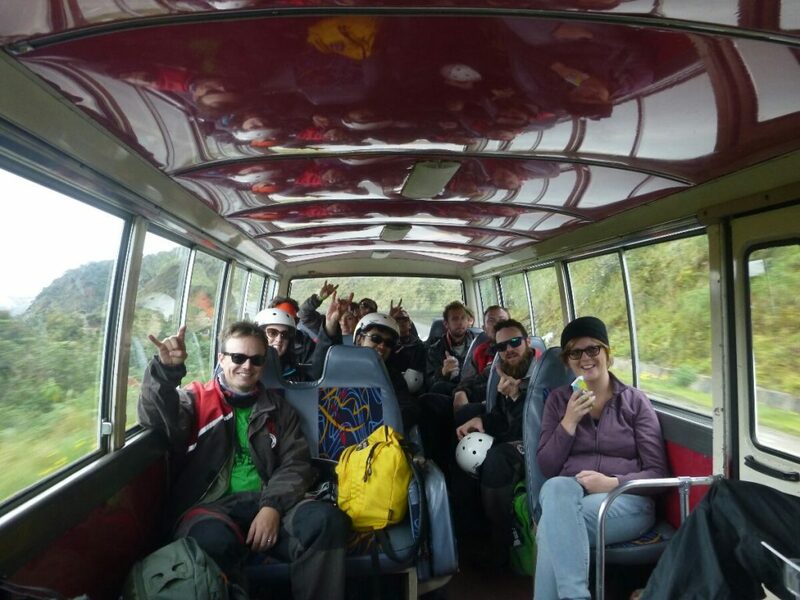 I rode down, Renee stayed on the bus – arguably a more frightening prospect. 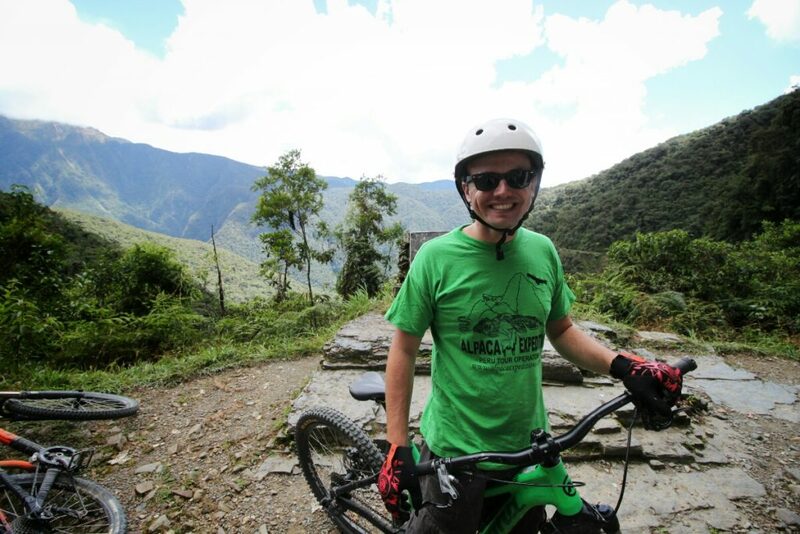 Literally every tour operator in La Paz has options for riding the Death Road, with greatly varying prices. I went with Gravity Assisted Mountainbiking. They are one of the most expensive operators, but in this case it is worth avoiding the bargain basement. I saw people riding down on clapped out Kmart bikes. There are fairly big rocks and corrugations, and a 600m cliff on your left. 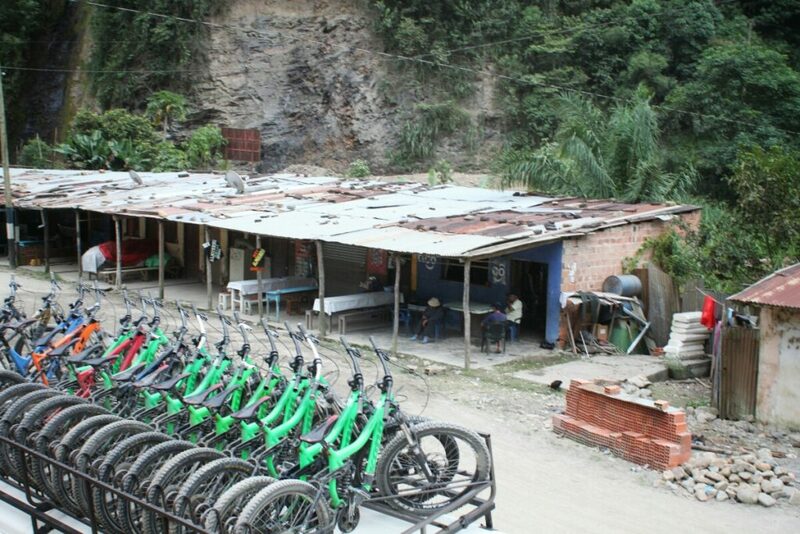 You really want to just enjoy the ride, without having to worry about your bike falling apart. Gravity use high end Kona dual suspension downhill bikes. Mine looked brand new. The bikes eat up the bumps and gravel, giving you confidence to just aim where you want to go. 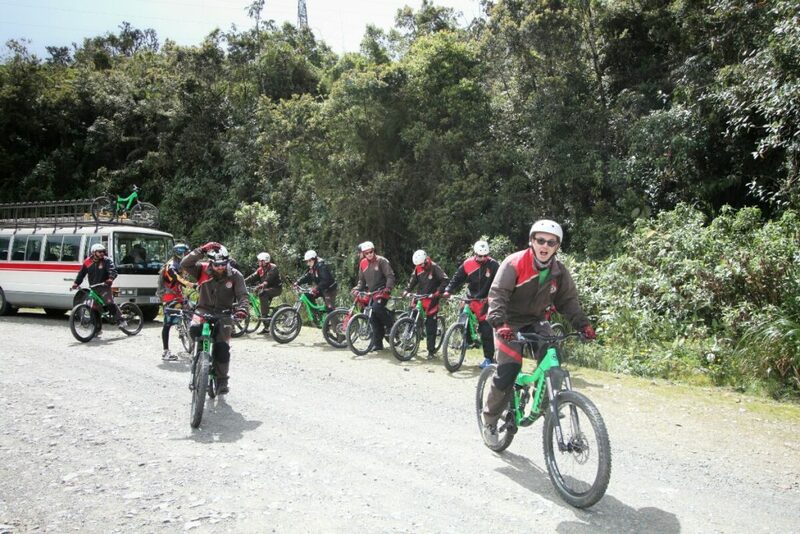 Our guides were a fairly entertaining German guy and a Bolivian woman; both seriously good riders. 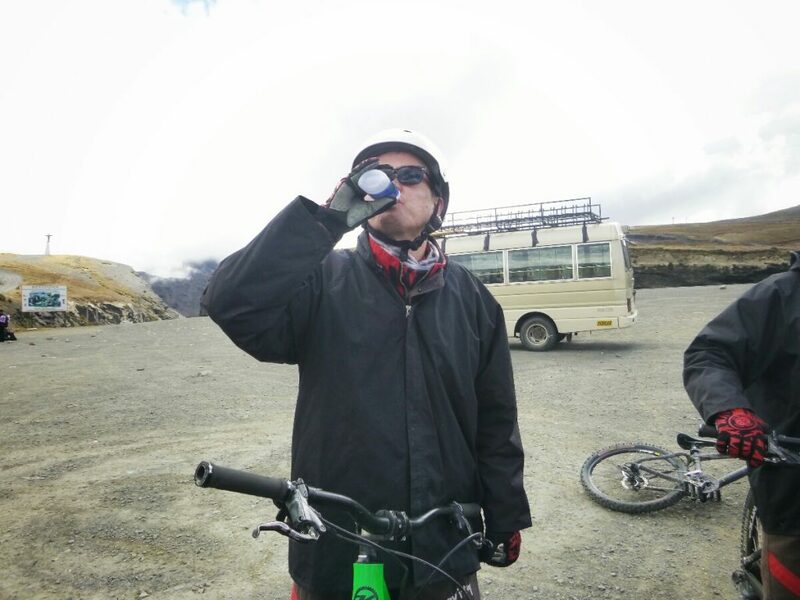 The ride starts about 40 minutes from La Paz. The first few km are on bitumen; really just to get you used to the bike and for the guides to suss you out and make sure you aren’t totally useless and don’t have a death wish. After that you enter the Death Road proper. From then it is about three hours riding, with frequent stops for breaks and to get a rundown on the next session. The ride is almost entirely downhill, fast, and a lot of fun. 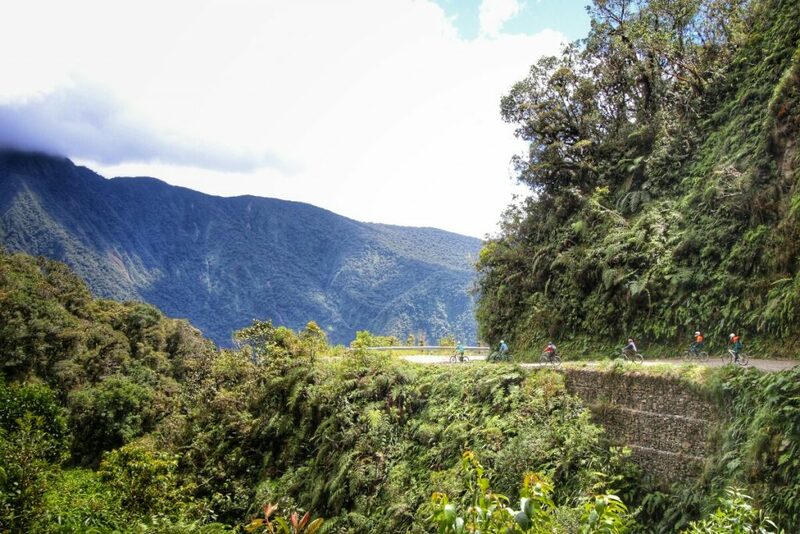 The Death Road is still a public road, though we only passed two trucks going uphill. Uniquely for South America, you ride on the left side of the road. The scary reason for this is so the downhill drivers are closer to the edge. If they need to reverse up to give way to uphill vehicles, the driver has a better view of just how close the tyres are to going over the edge. You can ride at whatever pace you feel comfortable. The thing with downhill though is it gets easier as you go faster. The bike just glides over the bumps. I was doing my best to keep up with the crazy German guide, while others took their time. Of course, the faster you go, the less you see. There is a constant urge to look left; it is incredibly beautiful. We had one crash in our group. A guy from Brisbane came off, thankfully on a straight section. He maybe fractured his wrist and grazed himself up a bit. He took the rest of the road in the bus, but was happy to drink beer with everyone at the end. The temperature warms up as you drop in altitude. 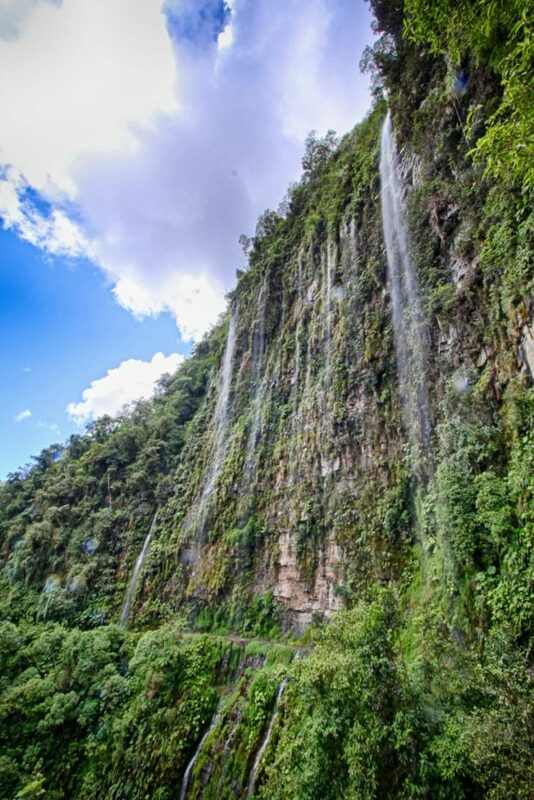 You ride through waterfalls and forest. The whole time the view of the valley tempts you over your left shoulder. At the bottom of the road is a tiny one street village, with a large supply of beer. A fitting end to three hours on the bike. 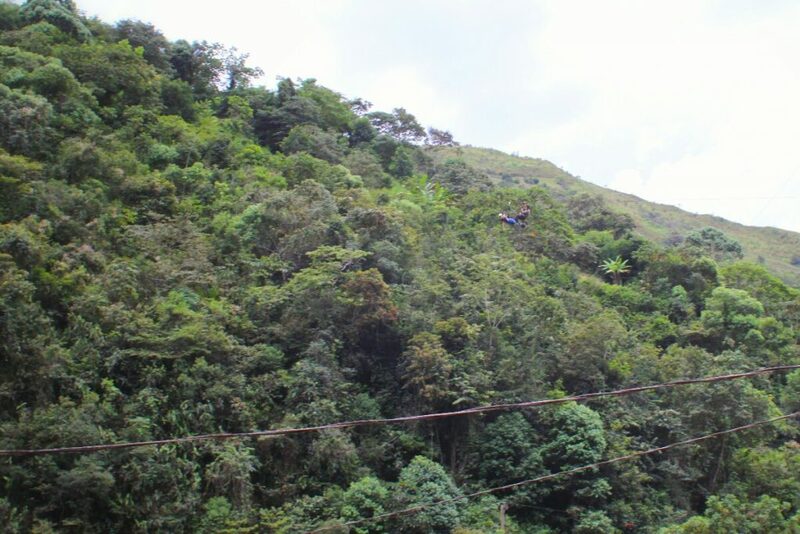 Renee took a trip across the valley on ziplines. Then we stopped for a late lunch at La Senda Verde, an animal refuge where the humans are in a cage and the animals roam free (restricted by a river). For most people, the bus will return back to La Paz. 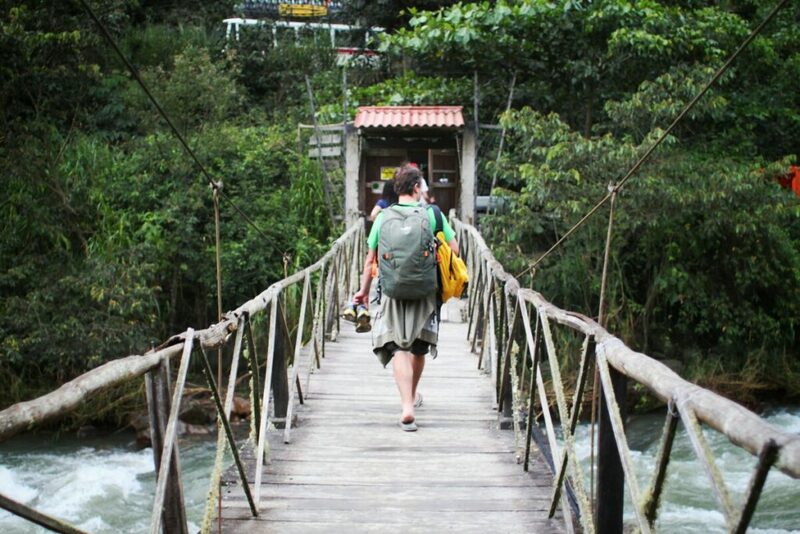 We took a cab to the nearby town of Coroico.